I ordered these there Personalized Easter Bunnies for my 3 grandson's (ages 5yrs, 2.5 yrs and 9 months) I think this was the favorite think in their baskets!! Wish I would have ordered 2 pink ones too for my cousins little girl, Alexis (age 3 yrs and Alexis' twin sister who passed away last year) who got to celebrate Easter with our family this year. No one can resist the adorable look of this Blue Easter Bunny! He is super cute and has a wonderful feel to make him an excellent Easter Basket accessory. 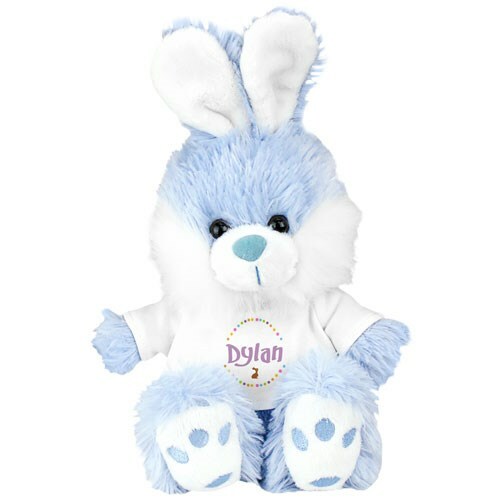 Your Personalized Easter Bunny measures 12" tall, wears a blue satin ribbon and is surface washable. He features plastic eyes, stitched mouth and paw prints on his feet, with contrasting fur on his mouth, cheeks, feet and the inside of his cute floppy ears. FREE Personalization of any name on his little shirt is include. Free gift wrapping and a free message card is included. Wonderful. Nicer than even the picture. Love it. Going to order one for my granddaughter. My nephew loved this Easter gift and delivery was extremely fast. Additional Details Shop 800Bear.com for all of your fun Easter Plush Animal Gift Ideas. Any Personalized Bunny you choose will become an instant favorite and will be a wonderful keepsake enjoyed well after Easter is over. Be sure to also view our Pink Easter Bunny as well.